I’ve always wondered why it is, but blends seem to play second fiddle in McLaren Vale, sitting even further behind straight varietals than in many other South Australian regions. Such a single varietal focus is even more unusual given that there’s such a range of grapes planted in the Vale, including old plantings of Cabernet and Grenache going begging, let alone newer goodies like Sangiovese and Nero (which should enable more blending). There’s a veritable fruit salad of white grapes to boot, with everything from Fiano and Vermentino to surprising amounts of Verdelho, Sauvignon Blanc and Chardonnay still in the ground (don’t forget McLaren Vale was once the home of the hugely popular Seaview sparklings). 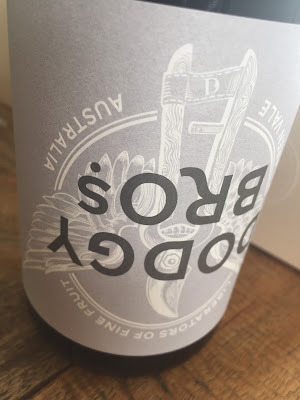 In some ways this ‘blend blindness’ could be as an end result of one style being just too hard to ignore (like straight Shiraz), which just encourages even more of a mono-varietal movement. Such a movement is also perpetuated by things like the (brilliant, I don’t want to besmirch it) Scarce Earth program or a proliferation of new alternates that need explanations of their own without blends muddying things further. Yet it also seems like the lack of blends might be a ‘McLaren Vale thing’, much like how wild fermentation is still a rarity in Vale Shiraz production. Still, if you need an example of what can be done with a little judicious blending, this GSM is it. Made by Wes Pearson, who has a day job as a scientist at the AWRI, this is drawn from a vintage that looks to be a winner for Grenache and Mourvèdre (and less so for Shiraz), this blend of 70% Grenache, 18% Shiraz, 12% Mourvèdre comes from the warm Sellicks foothills – also a great place for growing Grenache. It follows that the appeal is all about Grenache. Well handled, minimally oak influenced, spicy Grenache, the palate a riot of redcurrant fruit that floods your mouth, backed by the deeper grunt of Shiraz and Mourvedre. It’s an essay in concentration and yet energy too, the texture and tannins almost spot on. Would I buy it? Yes. Would finish a bottle of this no sweat. Well priced too. The first time I was in the McLaren Vale was several years ago on a trade visit, and I had a similar thought that they were focusing too heavily on single varietal shiraz and cabernet, and not enough on grenache or even better, grenache blends. Considering the proximity to the coast but still relatively warm climate, doesn't it make sense to make more Provencal-style wines? After chatting with Brad Hickey (Brash Higgins) on The Vincast the other day, I'd also like to see more mediterranean varieties in general, both red and white, and less oak as well. Nice post Andrew!